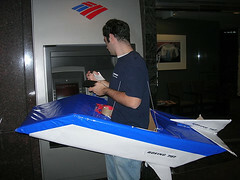 Some of you may remember my Halloween costume from last year (see picture to the right). You may have guessed that I may be something "airplane related" again this year. And you would be 100% correct. I will be in Las Vegas for Halloween weekend this year, and I'm sure I'll have some great pictures of my costume to post when I get back from that trip. There is more to Halloween than just costumes though. Last night, I went to a friends house and we carved some pumpkins, drank pumpkin-spiced ale, and (I kid you not) listened to The Smashing Pumpkins. Yes, it was a Pumpkin Hat Trick. 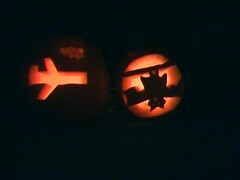 As you can see, I (unsurprisingly) carved a rough representation of an airplane into my pumpkin. I was going to try to get a little more fancy with it, but came to the conclusion that I would probably just screw it up or cut myself. You can tell its an airplane, so I'm happy. Katie decided to be fancy, search the internet, find a template, and carve that into a pumpkin. Cheater.